Posted by Stuart Herbert on May 5th, 2010 in Desktop Wallpaper, Edwardsville, Iron & Steel, Modern, Shoot, Taff Trail, Tramroad. Download the full-size picture (3245 x 2597) to use as your desktop wallpaper. My idea of escapism is often as simple as walking down places that most people never see because they’re in too much of a hurry to get out of their cars and wander about. The Taff Trail north of Navigation (modern-day Abercynon; the original administrative centre of the Glamorganshire Canal) is one such place. Running along the Penydarren Tramroad, the route of the world’s first steam engine railway journey in 1804, this section of the cycle trail leads up under modern road bridges like this one before breaking out into the Pontygwaith Nature Reserve. Beautiful all year round, this is a wonderful place to talk a quiet and contemplative walk. 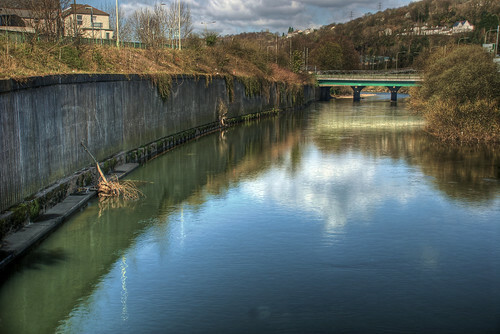 Posted by Stuart Herbert on May 10th, 2009 in Merthyr Road, Modern, Pontypridd, Pontypridd, Caerphilly and Newport Railway, River Taff, Shoot, Taff Vale Railway (Modern-day Valley Lines), Tramroad, Treforest. 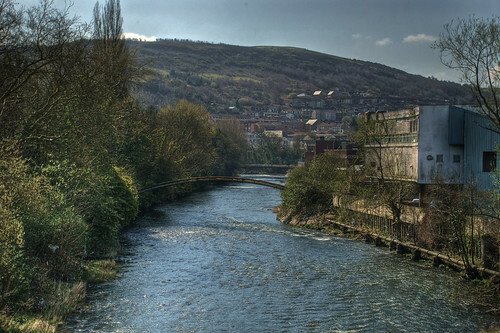 Pontypridd stands on the banks of the River Taff and the River Rhondda as the gateway to the valleys beyond – and the mineral and coal riches that were exploited between the late 1700’s and the 1980’s. From its first bridge in 1750, built to allow travel to market without crossing a deadly river ford, via what is possibly the world’s oldest surviving railway bridge, to the modern road bridges of today, it has always been necessary to bridge the rivers at Pontypridd in order to get from A to B.
I was taking a week off between jobs to get my annoyance with my former boss’s behaviour out of my system, and it was a real relief to get out and about with the camera. The weather was lovely, and what could be better than a walk through Pontypridd taking shots of the different bridges that have sprung up in this market town? I’m always surprised at how Pontypridd has failed to capitalise on Cardiff’s growth. Why hasn’t it become a booming commuter town for everyone who can’t afford the house prices down in Cardiff itself? Sitting at the very northern end of the Taff Vale, the old TVR railway splits north of Ponty to take travellers up the Rhondda Valley to Treherbert, up the Cynon Valley to Aberdare, and up the Taff Valley to Merthyr Tydfil. That gives Ponty three times the amount of trains passing through each day. Today, Pontypridd feels more important to the folks who travel down from those valleys than anyone else, marking as it does the half-way point in the journey from the tops of the valleys down to Cardiff. I guess the history of its bridges shows that Pontypridd has always been a place people travel through rather than a destination in its own right. I believe that this bridge is probably all that remains of the Llancaiach TVR branch that ran from just north of Pontypridd up to the Albion Collery. The bridge that Pontypridd takes its name from. 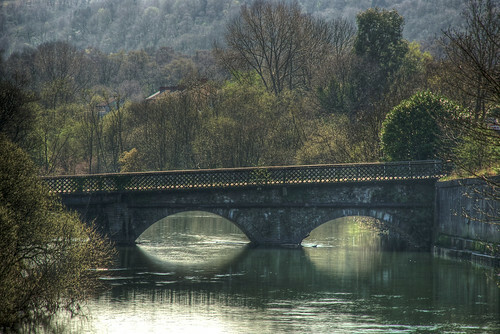 Built in 1750 by William Edwards, at the time it was the longest single-span bridge in the world. Today, it is used as a footbridge. There aren’t many red telephone boxes left these days. 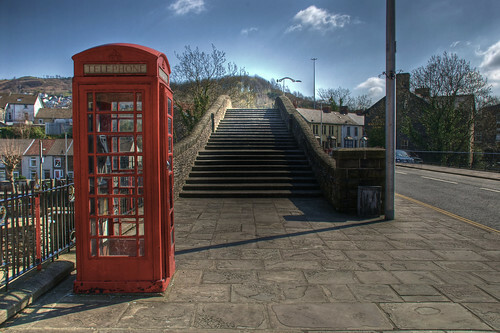 This one stands at the western end of the Old Bridge, Pontypridd. You can see from this shot just how steep the Old Bridge actually is! From the top of the old bridge, you can look down the River Taff, past the sadly run-down Taff Vale Precinct on the right to the foot bridge that links Ynysangharad Park with the main shopping area of Taff Street. 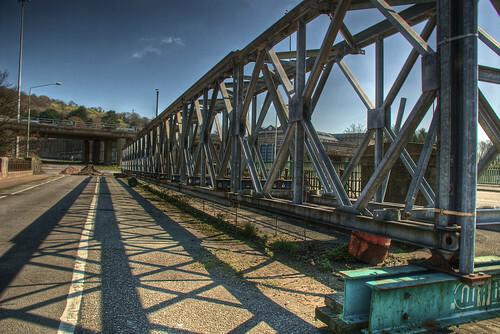 This bridge carries the Rhondda branch line up to Treherbert. The line was opened in 1841, not long after the main TVR route was opened. At the time of writing, I don’t know whether this is a Brunel bridge like its sister bridge is to the east. The Pontypridd Signal Box stands between the TVR branch line up to Rhondda and the main TVR line up to Abercynon and beyond. These steps appear to be the main route up to the signal box. The signal box itself appears to be disused today. 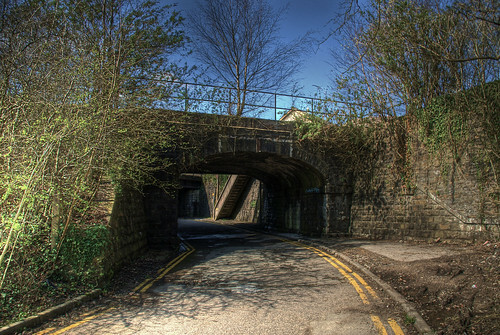 Today, it’s a road bridge carrying traffic from the A470 up to the north end of Broadway and past Pontypridd station. 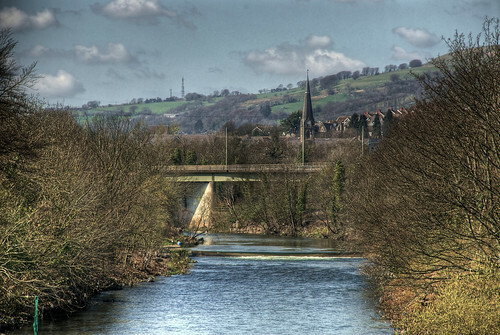 But before this was built, there was once a railway bridge somewhere in the same area, carrying trains from the TVR over the Taff and onto the Pontypridd, Caerphilly and Newport railway. Like the bridge, the PCN railway is long gone, but its trackbed survives as part of the Taff Trail cycle network between Pontypridd and Nantgarw. This is without doubt my personal favourite bridge in Pontypridd. 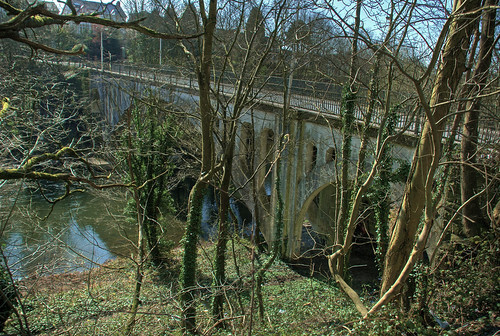 Built in 1850, this bridge allowed the small iron works on the western bank of the Taff (which today has been lost under a housing estate and a popular local park) with the Glamorganshire Canal. I believe this bridge used to carry a light railway or very short tram road. Today, it’s a wooden-floored footbridge, and I often cross it after visiting the Yummy Kitchen on the way home from work. 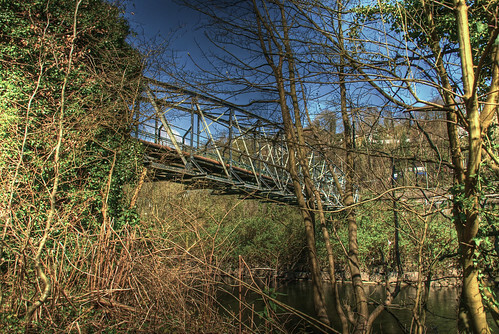 I like the Abercynon Iron Works bridge so much, here’s a second shot of the bridge from down below. I’ve been over the Abercynon Iron Works bridge hundreds of times, but it was only when I went to photograph it that I discovered that it goes over more than just the River Taff. I’ve never seen or read about any sort of tram road running along the western shore of the River Taff, so today I am at a lost to say what went under the bridge here. Maybe this is simply a modern addition to enable access to the river bank from the park? 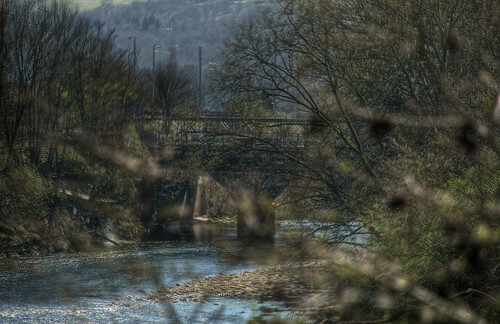 You can just about make out the arches of the old Machine Bridge at Glyntaff. 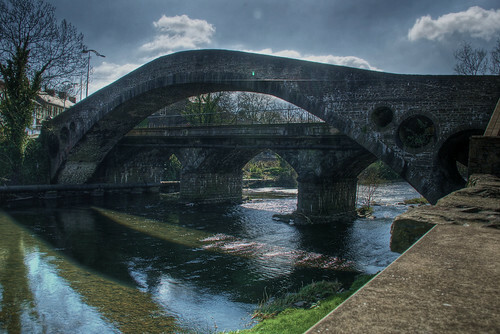 According to GaAC, this bridge was built to carry the Doctor’s Tramroad across the Taff to the Doctor’s Canal, where goods from the Rhondda were transferred onto canal barges and shipped downstream and into the Glamorganshire Canal proper. 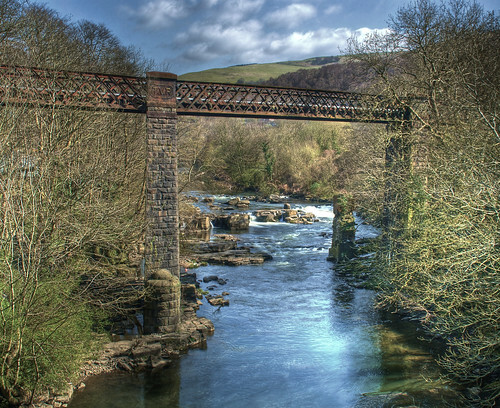 GaAC speculates that this might be the oldest surviving railway bridge in the world, predating all of the bridges that carried the Penydarren Tramroad down from Merthyr to Navigation. 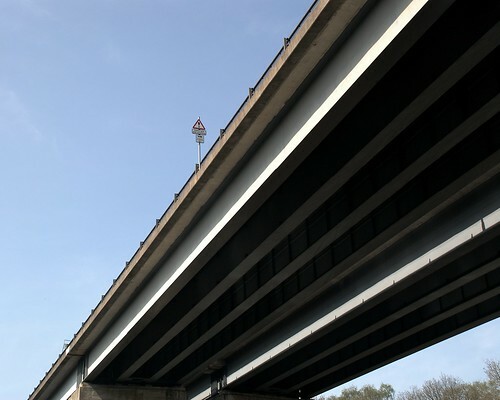 This view has also been expressed in a local news article about a threat in 2003 to demolish the bridge. Fancy that, and yet there’s no sort of plaque or anything information-like on the bridge itself that I’ve ever seen. Unfortunately, I took no notice at all of the old Machine Bridge at Glyntaff when it was still in use by cars, so I have idea what this lattice framework is for, or where it originally fitted into the bridge’s construction. 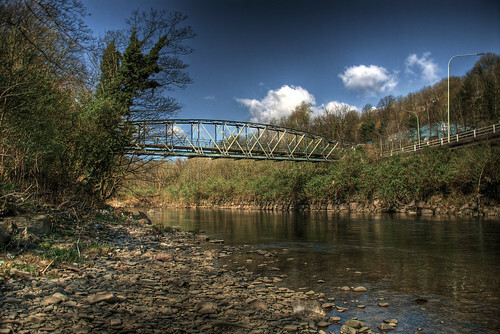 For many years, the Machine Bridge was the main road link between the A470 and Treforrest. The fabric of the bridge couldn’t withstand the traffic, and the bridge was for a time threatened with demolition. Thankfully, common sense seems to have prevailed, with a new road bridge having been built immediately south of the Machine Bridge. Today, the Machine Bridge is a footbridge, closed to traffic, but popular as a car park with council workmen or their contractors. Isn’t this a beautiful bridge to look at? I’m afraid that, atm, I don’t know anything about it, but I certainly would love to. This set of photos marks the start of the next evolution in my photographic style. I’ve been using HDR for several months now, but this time I was determined to put together a workflow that brings the HDR images closer in initial appearance to regular, single-frame photos. Before HDR, my favourite style had been the slightly desaturated look of the Taff Vale Eastern Ridge Walk set. What I wanted was that look, but with the added detail that HDR brings. Too many HDR photos just lack a certain subtlety – as do too many single exposure shots, it has to be said! Since taking these photos a year ago now, I’ve refined the HDR workflow over and over before finally coming back to these photos and re-processing them for publication at last. I promise that I’ll do a full article on the workflow in the near future, but the main points are to avoid over-saturating the original HDR image, and then using Aperture 2’s new Saturation and Definition tools to bring out the best of the HDR detail whilst toning down its exuberance at the same time. Sadly, I’ve been too short of time to thoroughly research each of the bridges in this set. 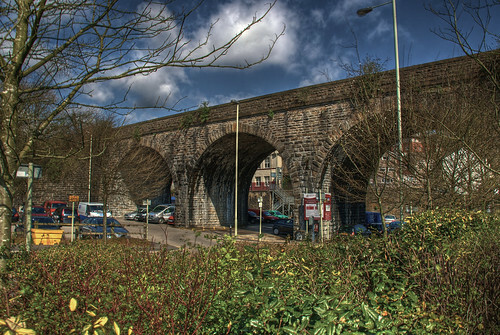 There’s also one bridge missing – Brunel’s bridge that carries the Taff Vale Railway north from Pontypridd station over the River Rhondda towards Abercynon. I only noticed that whilst doing the write-up. Doh! 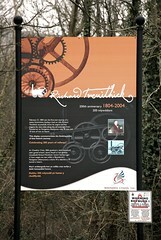 Posted by Stuart Herbert on October 24th, 2007 in Iron & Steel, Merthyr Road, Modern, Pontygwaith, River Taff, Shoot, Taff Trail, Tramroad. View all the photos from this shoot as part of my Merthyr Road series on Flickr. Needing to get out of the house after a stressful week for us both, my wife and I jumped in the car and headed up the road to the Pontygwaith Nature Reserve. I’ve been here before, but this was the first time that my wife has enjoyed a walk in this beautiful place beside the River Taff. The last time I came up the old tramroad, the path from the south to the overbridge at Pontygwaith was somewhat overgrown. Since then, the path has been completely cleared, and fresh gravel laid. It looks much better now, although I can’t help but wonder how many cyclists head north under the overbridge without realising that the Taff Trail actually cuts left at this point to go over Pontygwaith itself. Here are the photos from Sunday’s walk. Click on the thumbnail to see a larger version of the photo that interests you. I toyed with the idea of desaturating the colours from this shoot (to match the style I used in the Unofficial Taff Vale Eastern Ridge Walk), but to be honest I’m so pleased with the colours captured by the Panasonic Lumix DMC-FX33 that I decided to limit my adjustments to edge sharpening. I’m not completely convinced by the FX33’s colours in dull light (such as the colours captured in this shot), but in brighter light, the camera did very well.